The president of the Spain-based Association of Sahrawi women for democracy and human rights, Aicha Rahal, expressed Monday in Rabat, total rejection of “any exploitation of the goodwill of the Swedish people to encourage separatism,” alluding to the recent offensive against the Moroccan Sahara, staged in Sweden and other Scandinavian countries. Aicha Rahal, who visited Sweden this October 13 to 17 at the head of a delegation of her association, explained that the purpose of the visit was to inform the public opinion about the ins and outs of the Sahara conflict, and correct the “false image” on Morocco portrayed in Sweden by the “Emmaüs” association, hostile to the Kingdom. She said her association members also wanted to draw the attention of Swedish authorities, the public opinion, and the media to the blatant human rights violations prevailing in the Tindouf camps, where the Sahrawi populations are forced to live in inhuman conditions. These conditions are aggravated by the large-scale diversion of international humanitarian aid by the Polisario Front leaders, she said. 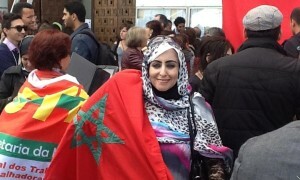 Aicha Rahal also deplored the absence, in Scandinavian countries, of Sahrawi voices advocating their belonging to Morocco and their attachment to the territorial integrity of their country. She called on civil society and Moroccan associations to mobilize in these countries, through parallel diplomacy actions to thwart the plots of Morocco’s enemies. “Any attempt at the territorial integrity of the Kingdom constitutes an assault against the Moroccan people,” she argued in a statement relayed Monday by the Moroccan press. The two Moroccans were thus prevented from attending a meeting on the Sahara held at the Swedish Parliament headquarters in Stockholm. The Association of Sahrawi women for democracy and human rights, set up in 2009 in the Canary Islands, is mainly active in Europe and endeavors to defend the Moroccan identity of the Sahara territory.